Any great gardener will tell you that you need to know your soil before planting. One of the best ways to know this is by taking a soil sample. 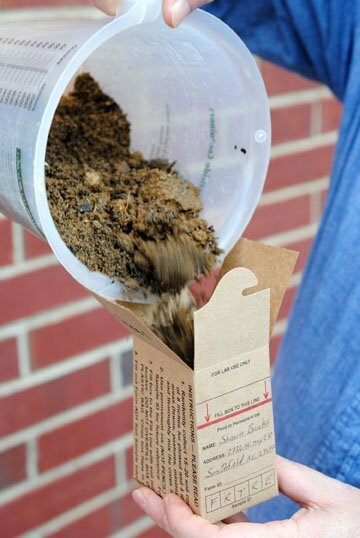 Samples can be sent to the North Carolina Department of Agriculture and Consumer Services’ (NCDA&CS) soil test lab. There is no charge for this test April through Thanksgiving and then a nominally fee from Thanksgiving through March, so it can’t hurt to have it done. They will check the pH, phosphorus, and potassium levels—the major areas where soil gets out of balance. 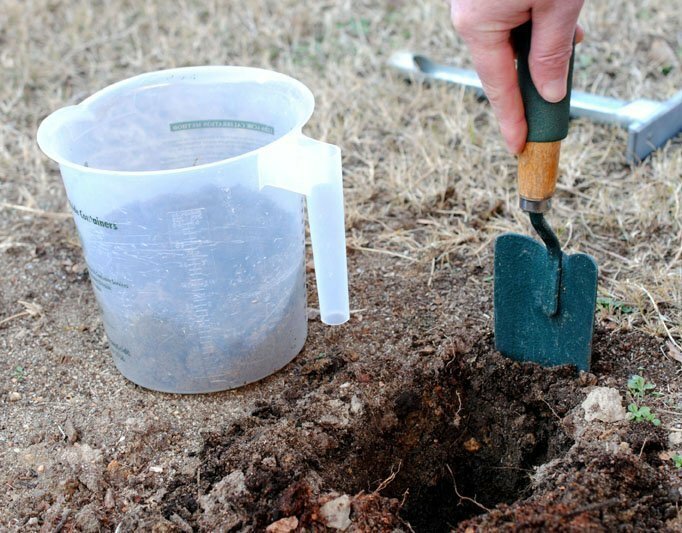 Before you get started, there are a few materials needed to take a soil sample: a soil probe, shovel or hand trowel to collect the soil; a plastic container to hold the collected soil; a pencil or pen to write with; the proper box and form obtained from a local Cooperative Extension office or the soil test lab in Raleigh. 1. Select the area to be sampled. This may be a vegetable garden, flowerbed, an area of the lawn, or another planting area. 2. Before collecting the soil, fill in the information on the side of the box. The sample identification number should be something that will identify where the sample came from. Some examples include a vegetable garden VEGDN, front lawn FTLWN, or fruit trees FRTRE. 3. For those with a soil probe, push the probe into the ground about six to eight inches and pull out a core to put in the bucket. 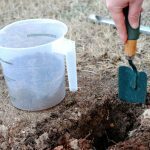 Most people don’t have a soil probe, so a hand trowel or a shovel will work. 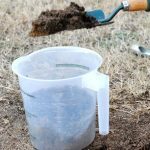 With the hand trowel, dig a hole six to eight inches deep, then take a slice of soil about one-quarter inch thick from the side of the hole and place that in the container. 4. Repeat step #3 eight to twelve times in the area to be tested. Put all the cores or slices into one container. 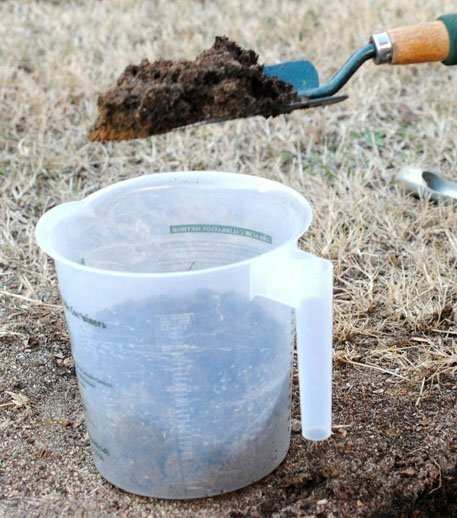 Mix the soil well to provide a representative sample of the entire area. 5. Pour the soil into the sample box until it is filled to the red line. The lab needs this much soil to run the tests and get accurate results. 6. Close the box and you are finished collecting the soil. The form provided with the box must also accompany the soil sample. When filling in the main part of the form use the sample identification from the box, list the crop that will be grown (lawn, vegetables, trees), and the crop code. Crop codes can be found on the back of the form. Unless you are a farmer with acres of land to treat, use the crop code that best describes the area under the heading Home Lawn and Garden. Instructions for filling out the form can be found on the back of the form itself. Fill in the contact information at the top and be sure to include an email address. The NCDA&CS will send an email with the test results. The last thing to do is send the sample to the soil test lab. Many county cooperative extension offices will collect sample boxes, and then transport them to the lab. 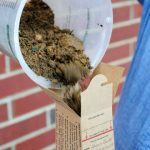 If this service is not provided, samples can be mailed to the soil test lab in Raleigh using the address provided on the soil sample form. Contact your local cooperative extension office for more information.